After six weeks’ passage across the ocean, up rivers and on the road, the newest member of Fermilab’s family of neutrino detectors has arrived. 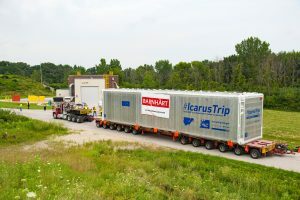 The 65-foot-long ICARUS particle detector pulled into Fermilab aboard two semi-trucks on July 26 to an excited gathering who welcomed the detector, which has spent the last three years at the European laboratory CERN, to its new home. The ICARUS detector will be instrumental in helping an international team of scientists at the Department of Energy’s Fermilab get a bead on the slippery neutrino, the most ubiquitous yet least understood matter particle in the universe. The neutrino passes through outer space, metal, you and me without leaving a trace. Scientists have observed three types of neutrino. As it travels, it continually slips in and out of its various identities. Previous neutrino experiments have seen hints of yet another type, and ICARUS will hunt for evidence of this unconfirmed fourth. If found, the fourth neutrino could provide a new way of modeling dark matter, another of nature’s mysterious phenomena, one that makes up a whopping 23 percent of the universe. (Ordinary matter makes up only 4 percent of the universe.) A fourth neutrino would also change scientists’ fundamental picture of how the universe works. Fermilab is ICARUS detector’s second home. From 2010 to 2014, the Italian National Institute for Nuclear Physics’ Gran Sasso laboratory built and operated ICARUS to study neutrinos using a neutrino beam sent straight through the Earth’s mantle from CERN in Switzerland, about 600 miles away. ICARUS’ lead scientist, Nobel laureate Carlo Rubbia, innovated the use of liquid argon to detect neutrinos. ICARUS is the largest liquid-argon neutrino detector in the world. Its great mass — it will be filled with 760 tons of liquid argon — gives neutrinos, always reluctant to interact with anything, plenty of opportunities to come into contact with an argon nucleus. The charged particles resulting from the interaction create tracks that scientists can study to learn more about the neutrino that triggered them. In 2014, after the ICARUS experiment wrapped up in Italy, its detector was delivered to CERN. Since then, CERN and INFN have been improving the detector, refurbishing it for Fermilab’s mission. CERN completed the project in May and sent ICARUS on its trans-Atlantic voyage in June. “This is really exciting — to have the world’s original, large-scale liquid-argon neutrino detector at Fermilab,” said Cat James, senior scientist on Fermilab’s Short-Baseline Neutrino Program. Fermilab’s Short-Baseline Neutrino Program involves three neutrino detectors. ICARUS is one, and now that it has safely landed at Fermilab, it will be installed as part of the program. Another detector, MicroBooNE, has been in operation since 2015. The construction of the third, called the Short-Baseline Near Detector, is in progress. All three use liquid argon to detect the elusive neutrino. The development and use of liquid-argon technology for the three detectors will be further wielded for Fermilab’s new flagship experiment, the Deep Underground Neutrino Experiment. Fermilab and South Dakota’s Sanford Underground Research Laboratory broke ground on the new experiment on July 21. “We’re really looking forward to working with our international partners as we get ICARUS ready for first beam,” James said.